Today is the first day of Fall, the autumnal equinox, “one of the two periods of the year when the sun crosses the equator and the days and nights are in equal length all over the earth” as explained by this article. To celebrate this shift in seasons, we have a new Past/Present for you- two artists’ representations of autumn landscapes. The first is a 19th century depiction of the Starrucca Valley, located in Pennsylvania near Lanesboro. One of the few prints produced after a painting by Hudson River School artist Jasper Cropsey, this image was printed exclusively for members of the Crosby Opera House Art Association. 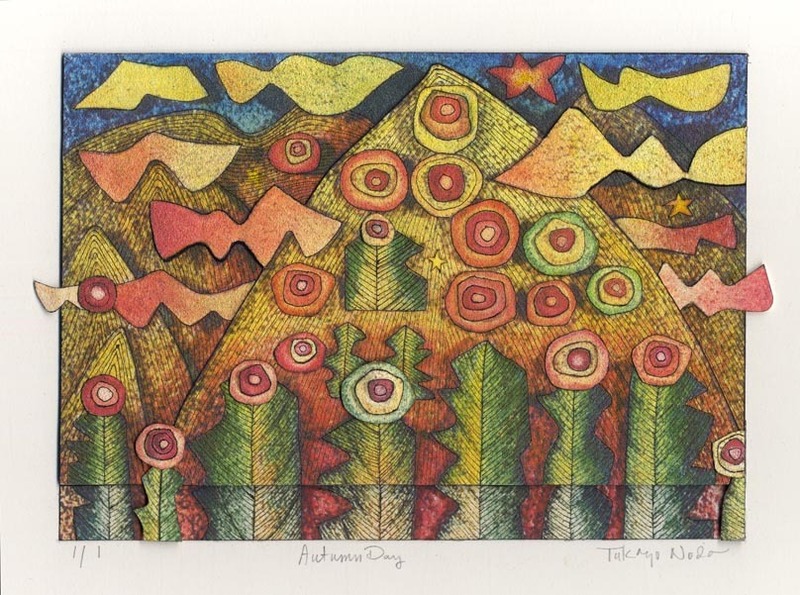 We’ve paired it with a hand-colored transfer print and collage by contemporary printmaker Takayo Noda. We hope you enjoy these colorful celebrations of Fall! 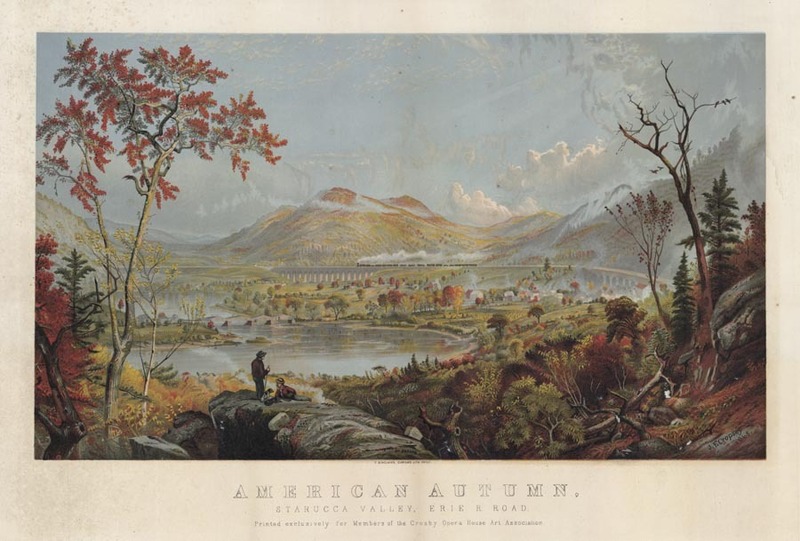 Image on the top: American Autumn, Starucca Valley, Erie R. Road. By Jasper Cropsey. Published by T. Sinclair’s Chromo Lith., Philadelphia. Lithographed by William Dresser. Chromolithograph, undated, c. 1870s. Image size 15 1/2 x 26 5/8″ (394 x 677 mm). LINK. Image on the bottom : Autumn Day. By Takayo Noda. Transfer print, hand-colored, 2013. Three dimensional collage in areas. Signed, titled and inscribed “1/1.” Image size 6 7/8 x 9 5/8″ (175 x 243 mm). LINK. American Autumn, Starucca Valley, Erie R. Road. LINK.